Kill all humans was to be a game where you control a lost robot on a human spaceship heading to attack an outer world. The aim was to kill all humans and scientists that cross your path across multiple levels of the ship. So what happened to the game? Enthusi and Ptoing suffered from real life getting in the way, and there would be some hefty work and scheduling involved to get the game completed. More details can be found from Enthusi in the Creator Speaks section. KAH stands for “Kill all humans”. Use joy in port 1 for this one. An game idea ptoing and me came up with after the first NEH – not even human game. You’d control a lost robot on an human spaceship heading to attack an outer world. You’d run berzerk and had to kill basically all humans/scientists that cross your path. 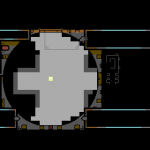 Multiple levels among the ship, each featuring a 100×100 map. sight from your robot. This is carried out in charmode. The rendered map is than converted into hires bitmap on the fly replacing all chars with true 2 color hires bitmap tiles. Automapping included. 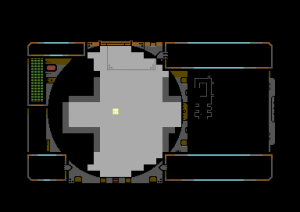 All gfx as well as the HUD and the test-level-map by ptoing. You will find some tiles marked ‘T’. Those are terminals. The idea was to switch to some cyber-engine then that instead of using the paths inbetween the walls, utilizes the walls (i.e. same levelmap data) for you to travel in cyberspace to i.e. cut the life support in some rooms and have all people suffocate in there. We stopped on this project when real life took over and we realized that it would take some designated work shifts to continue. We still love the concept and idea. Personally I love the raycaster which in char mode is VERY fast as well. It was a bit tricky to get the corners right. I’m much less happy with the speed of the resulting hires-bitmap which is what’s keeping me from having this high on my list. Another case of required re-write since I learned so much since then.